Today is Food For Thought Friday and I am sharing a recap of the first day at the AYA Summit. This is a long post, but I do hope you read it anyway. As I sat in Google Headquarters in Washington DC attending the inaugural meeting of ONE.org’s AYA Summit, surrounded by women & men listening to the issues facing girls and women in developing countries, I found myself completely humbled to be one of only 75 invited writers. I kept thinking –why am I here? What is my purpose being in a room full of social influencers? And two weeks later, I’m still trying to digest it all. Last year, I attended my first Social Good Summit in NYC. The Social Good Summit is an event that brings together a myriad of social causes and those who are change makers. For two full days, panels of 4-5 people, ranging from former Vice Presidents to photo journalists for National Geographic, World Leaders to representatives from the UN rotate every 15 minutes between 8AM- 6PM to teach and inform about their organizations and their global impact. We learned about global warming, AIDS, war-torn refugee camps, drones in the Congo and maternal health. I heard Malala speak for the first time on the importance of education. It was so overwhelming that on the last day, I broke down and wept while walking down a New York City sidewalk. How does one choose one cause over the other? I felt helpless rather than inspired to act. It was all too much. Fortunately, I was able to travel to this conference with my ever inspiring friends(Nicole & Jen) and had the opportunity to meet up with others (Nicole, Elizabeth, Jen) who are passionate in their advocacy (Jeannine) for those in need. Listening to their stories and experiences is what inspired me to be more involved in Social Good. When asked if I wanted to become a partner with ONE Girls & Women, I said yes, without hesitation. I may have morphed over time from writing a mom blog into a food blogger, but I am still a woman, a wife, a mom, a daughter, a sister; a global citizen who wants to make a difference any way I can. Then the invitation came to go to Washington DC for the AYA Summit. I wasn’t really sure what it was going to be all about, but I knew I wanted to be a part of it, I needed to be a part of it. My voice still matters. So, why was I here? I was in this room full of amazing people to learn. I was here to connect with others who, like me, were there to soak in every word and every story; and our two days together were full of stories. Something in the air was abuzz; something that I still can’t quite describe- but “it” was palatable- important things were going to happen and one could just feel it. We began our day with the lovely and charismatic Patricia Amira, also known as “Africa’s Oprah”. She moderated the summit from beginning to end and interjected her own life experiences, connecting in her own way with the panelists and attendees. We were introduced to a panel including award winning photo journalist Stephanie Sinclair of Too Young to Wed, and her tireless work to bring child endowment to the forefront. To hear that a child as young as five, yes, five can be married off is a thought I could just not wrap my brain around. Marquesha shared her story of being homeless for 5 years, longing to go back to school, then shocked the room with the news that now at 19, she is homeless again. The collective cogs on the wheel were almost audible as they clicked into motion as Marquesha’s story hung in the air. How can we help this young voice? It cannot be silent, for it must be heard. Journalist, NY Times columnist & two-time Pulitzer Prize winner, author Nick Kristof addressed the room and brought his new book A Path Appears. He spoke about how important it is to use our voices to advocate for global need stories, especially as citizen journalists, because mainstream media won’t. He challenged us all to realize we are not alone in this world and to get outside of our comfort zone bubble; get involved. Did you know that by volunteering, you decrease your mortality rate by 40%? Next came a beautiful soft spoken woman in the most gorgeous green dress. She is a survivor of Rwanda genocide. Clemantine Wamariya is a storyteller who shared a portion of her personal story about her journey, that began at age six, fleeing the “noise” of gunshots and screams, walking until the bottoms of her feet became one blister, giving way to crawling her way into living years in a refugee camp and how this experience has been a chapter in her life story and how thankful she is to be able to speak it. The lights in the room dimmed and Danai Gurira stepped to the podium. Many of you may know her as the character Michonne on the series “The Walking Dead.” Having never watched this show (yet), I had no idea who this wonderful playwright was as she sat in front of me for the entire summit. Danai graced us with 3 scenes from her play that even as I type this I am still getting goosebumps. It was incredible and I felt privileged to have been witness to such an amazing talent. We were all riveted and moved to tears as her characters played out in front of us. When Danai finished, we learned how her plays are written to bring the stories of war-torn Africa to the forefront. To give voice to those who fear they have none. 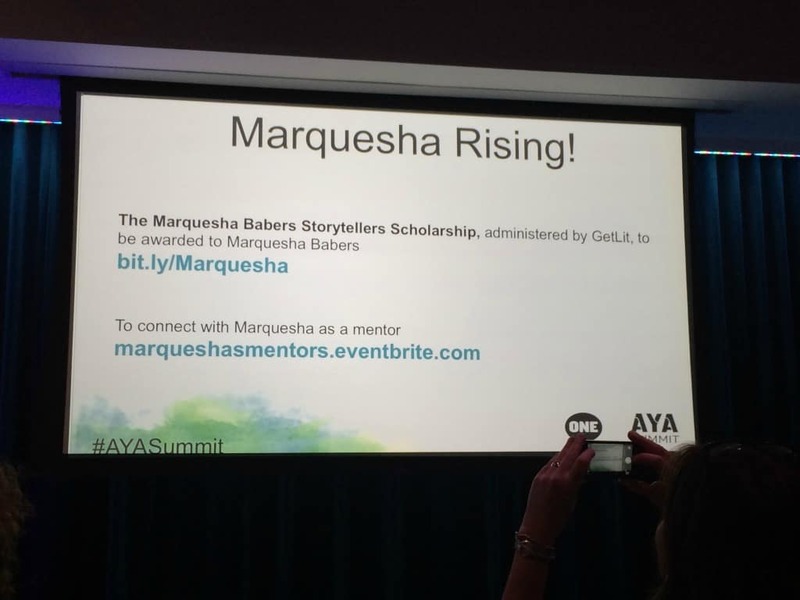 She then called Marquesha back on stage and shared the amazing power that a room full of women can do in mere hours. With using just her phone and an ipad, Aliza Sherman made things happen. As if our day was not emotional enough, it ended with Saa taking the stage. Saa is not her real name, it has been changed along with her appearance for safety reasons. She is one of the Nigerian schoolgirls kidnapped by the Boko Haram last April. You may remember the Bring Back Our Girls story on the news. This petite young girl bravely recounted the chilling story of how she & her friend escaped in the dark of night after watching their school burn to the ground, witnessing captors deciding whether or not shooting fellow classmates depending on their answers of being asked if they were Christian or Muslim, and loaded into a truck not knowing where they were going. They got away, but their classmates did not and you could hear and see the worry that permeates her voice and still sits heavy on her shoulders for friends. What is my purpose being in a room full of social influencers? My purpose is to share their stories. Our collective reach at this summit measured 45 million. One cannot deny the power of that ripple effect. In a few hours, a scholarship was created. I was reminded that I am still a storyteller and words woven together can inspire to make change, to do something to make a difference. In one day, I was challenged to look beyond my comfort zone, to be aware of issues that need not only my voice- but to remind you that your voice is needed too. Amazing recap, Kelly!!!! I loved the special time you spent with Marquesha on the last day. You are a sweet, sweet woman with such an outstanding heart. You were so in your space at the #AYA Summit! !